Nationwide — The beauty industry involves black women from all corners of the world as customers, stylists, clinicians, models, manufacturers, spokespersons and more. The ethnic beauty business is a $15 billion business that consists of a 96% African-American customer base, but roughly only 3% of the retailers are African-American. There has been talk in salons, on talk shows, at events and classrooms on what should be done about the disparities and discriminations in the industry. Some say boycott hair products, while others say boycott Asian-owned stores. However, there has been another group of individuals who have decided to take a more bold approach. Real Estate investor, Princess Hill, and award-winning competition and master stylist, Kelly Williams, who are long-time friends and Detroit natives decided to open their own beauty supply store in Detroit, Michigan, a city that has been hit harshly by the downsizing of the auto industry and the political scandal of former mayor Kwame Kilpatrick. Hill and Williams contacted Beauty Supply Institute (www.BeautySupplyInstitute.com), a company founded by economic activist Devin Robinson, who opened 3 of his own stores within 18 months almost 10 years ago (after being chased out of one by a golf-club-holding Korean owner for what turned out to be a case false accusation). 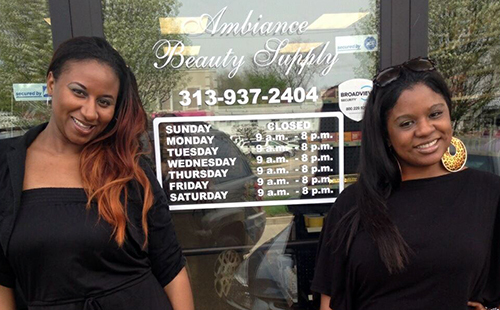 Robinson also staged a one-week boycott in 2009 against non-black-owned beauty supply stores. Since that time, Beauty Supply Institute has opened almost 70 stores for other black women in the United States, Canada and the Caribbean and have helped to generate over $13,000,000 in gross revenues for urban communities. Hill and Williams are already working on their second store in Maryland. Devin Robinson (www.DevinRobinson.com), along with George Fraser of Frasernet (www.Frasernet.com), and others will be featured panelist at the U.S. Capitol in Washington D.C. on May 19th, 2014 discussing issues in the beauty industry (www.TrichologySummit.com); an event organized by, trichologist and master educator Connie Judge, the founder of the National Trichology Training Institute in Stockbridge, Georgia. The Beauty Supply Institute will hold its 5th annual Beauty Supply Store Start-Up Summer Conference in Atlanta, Georgia on August 16-17, 2014. The keynote speaker will be nationally syndicated radio host, Michael Baisden.